If you’ve been hit with a restraining order in New Jersey, you may also be facing criminal charges. This means that you could be looking at a permanent restraining order, as well as prison time. Your best chance of fighting these potentially disastrous outcomes is to speak with a knowledgeable domestic violence defense lawyer as soon as possible. The Tormey Law Firm is a team of highly experienced criminal and restraining order defense lawyers who represent clients facing restraining orders and domestic violence charges, including stalking, harassment, aggravated assault, and terroristic threats in Roxbury, Dover, Morristown, Parsippany, Mount Olive, and throughout Morris County. Travis J. Tormey and the restraining order lawyers at his firm have the knowledge and skill to achieve superior results. In fact, Mr. Tormey has successfully defend clients at restraining order hearings in NJ courtrooms for many years. His team includes several former domestic violence prosecutors, one of whom served in Morris County. With insights from both sides of restraining order proceedings, The Tormey Law Firm crafts the most effective defenses for their clients and they handle both criminal charges and restraining orders that arise from allegations of domestic violence. If you are involved in a restraining order and/or criminal matter in Morris County or elsewhere in New Jersey, contact our Morristown office anytime at (908) 336-5008 for a free consultation about your case. If you’ve been charged with a criminal offense in New Jersey and are facing a Temporary Restraining Order (TRO), it is imperative that you understand the consequences of being convicted. There are two separate and distinct proceedings, so it’s possible for an experienced attorney to get the criminal charge dismissed but the final restraining order issued – and vice versa. Criminal Charges: When a domestic violence incident occurs in New Jersey, several things can happen. The first possibility is that the police, when called, may investigate and opt not to bring charges. In these cases, the victim does not want to press charges, there is no evidence of an assault, and/or the police did not witness an assault. However, a second possibility is that the police will decide that a criminal complaint should be filed against one party or both of the parties involved. The complaint will typically be for domestic violence criminal charges, such as simple assault, aggravated assault, stalking, or harassment. If criminal charges are filed, they must be handled in either the local municipal court or in the Morris County Superior Court, depending on the severity of the offense and the degree of the charges. If the charges are for an indictable, felony-level offense, they must be handled at the Superior Court. If the charges are disorderly persons offenses, they can be handled in the local municipal court. It is important to keep in mind that the criminal charges will be addressed in a completely separate proceeding from the issuance of a restraining order. 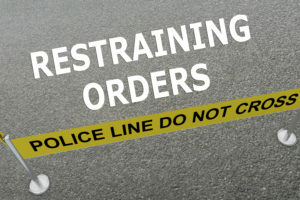 Restraining Orders: After a domestic violence incident occurs, the police will also ask the alleged victim if he or she wants to file a Temporary Restraining Order (TRO). If the party declines, then the criminal charges will still proceed but no restraining order will be issued. If the victim wishes to obtain a restraining order, a TRO will be issued and a Final Restraining Order (FRO) hearing will be scheduled in the Superior Court, Family Division, to be heard within 10 days. The Temporary Restraining Order (TRO) will prevent the defendant from going near the alleged victim, the victim’s place of employment, the victim’s home, and any other places or people that are named in the restraining order. If the defendant violates the restraining order, he or she will be arrested and charged with contempt of court. There are very different standards of proof and issues with regard to criminal charges, Temporary Restraining Orders (TROs), and Final Restraining Orders (FROs). If you or a loved one has been charged with a domestic violence-related criminal offense or you are facing a restraining order in Morris County, New Jersey, it is imperative that you contact an experienced criminal defense lawyer for help. Call The Tormey Law Firm at (908) 336-5008 to discuss your case or to arrange a free, in-person consultation at our Morristown office.